As European officials finally started reopening airspace to commercial flights on Tuesday, five days after a volcanic eruption in Iceland ground Europe's air traffic to a near halt, it wasn't just the planes that took off. The merde, too, began to fly. After suffering through days of travel chaos, fed up Europeans  whether they were directly affected, like stranded travelers and recession-hit airline executives, or just watching it on the news  targeted their frustrations squarely on the ministers of the European Union. Politicians from across the continent lashed out at what they saw as the E.U. 's sluggishness in a vociferous debate in the European Parliament on Tuesday  when about half of Europe's scheduled flights departed  blasting the bureaucrats in Brussels for being out of their depth in responding to the chaos. Europe, said German lawmaker Jo Leinen, was "ill prepared for natural disasters." Philip Bradbourn, a British Conservative Party member of the E.P., said the E.U. 's response had been like "licking a finger and sticking it in the air to see what way the wind is blowing." Since the volcano erupted in Iceland on April 15, a cloud of corrosive ash has drifted thousands of miles across the continent as far east as Russia. In trying to figure out how best to respond, officials found themselves facing two grim options: enforce a crippling disruption to business and travel, or risk a calamitous air accident. Computer models at Eurocontrol, the agency in Brussels that oversees traffic for the 28,000 or so daily flights in and out of Europe, suggested that the ash could cause severe problems to aircraft engines and possibly bring down a plane. So E.U. officials opted to err on the side of caution. But shutting down Europe's airspace for five days  an unprecedented move in peacetime  has left about 7 million passengers stranded this past week and has cost billions of dollars in losses, including an estimated $200 million a day to airline companies, which are still struggling to recover from the financial crisis. Some political analysts believe the blanket shutdown was unnecessary. Decisions were "motivated more by fear than science," said Jean-Dominique Giuliani, who heads the Brussels-based think tank Schuman Foundation, according to the French news agency AFP. "Could the real culprit be the principle of precaution?" But the problem of Europe's crisis management is greater than its long-held tendency to play it safe  an instinct borne from the expectation Europeans have that their governments will look after them in many aspects of their lives. Since the so-called Lisbon Treaty was passed in November 2009, the 27 E.U. countries have in theory been accountable to a single President in Brussels. In reality, each country makes its own decisions on a range of critical issues, including air travel  most of the time. Last week, though, Eurocontrol bypassed the multi-layered system of decisionmaking in Europe and declared most of the continent's airspace off limits. Before they could declare much of Europe's airspace safe, E.U. officials in Brussels needed to confer with ministers of transportation in capitals across Europe. Europe's new President, Herman Van Rompuy, should have played a starring role in the E.U. 's attempt to coordinate a response to the crisis. But media reports have been focusing on his new book of haikus, which was published on April 15, rather than his involvement in the air-travel ban. Instead, all the public knows for sure is that Europe's transport ministers waited until Monday  after a warm, sunny weekend and four days into the crisis  to hold a videoconference to coordinate their response. E.U. officials admitted on Tuesday that they had failed to distinguish between high-risk and low-risk zones since the volcano erupted, opting instead to shut all airspace. European transport ministers finally declared three levels of risk on Monday, including one zone that is still barred to airplanes because of the dangers from volcanic ash. Pummeled by criticism from politicians, the E.U. Transport Commissioner, Siim Kallas, an Estonian, said on Tuesday that the crisis had been exacerbated by Europe's fragmented air-travel authority. "Fragmentation caused by a patchwork of different national decisions is limiting available airspace," he told reporters. "This is not sustainable." Giovanni Bisignani, director general of the International Air Transport Association, whose 240 member airlines comprise about 93% of global travel, told reporters in Paris on Monday that the E.U. response was "an embarrassment," caused partly by the E.U. 's reluctance to unite its airspace under a single air-traffic authority. The airline industry has for years lobbied for more unified European air systems, which would allow any national carrier to fly to and from any airport and would free airlines from having to pay massive usage fees. "All these rules made sense 65 years ago," Bisignani said. Nowadays, he added, the rules are "absolutely not" valid. But before Europe can work on changing the rules, it has to work on getting its people back home. 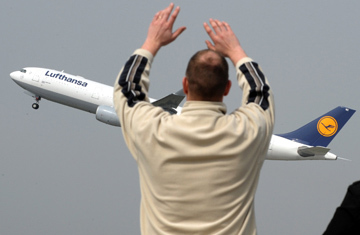 See "Bailout May Be in Store for Hobbled European Airlines." See "The Cost of Europe's Volcanic-Ash Travel Crisis."